Sidhil News: AND IT’S GOODBYE FROM COLIN! AND IT’S GOODBYE FROM COLIN! Long and relaxed days on the golf course beckon at last for Colin Thornton – after five years with Sidhil, he retired last week and will be sorely missed by us all! Colin’s calm manner and unfailing helpfulness made him a popular and respected colleague. His career spanned a number of demanding senior management roles, and he has earned his new life of leisure! As a retirement present, we took up a collection to help buy him a new laptop. We all wish him a really long and happy retirement – knowing Colin, he will be keeping very busy! 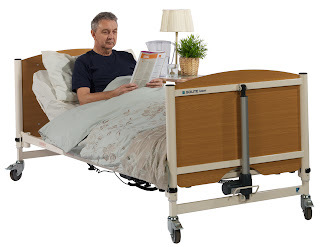 Colin has also been the face of Sidhil for some time, see below - Colin modelling the new SoliteUK bed! !